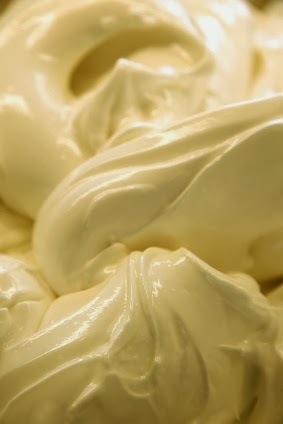 Crema flavor is the most popular flavors in Italian gelateries. It is as simple as gelato can get....milk, eggs, and sugar. It has a rich, yellow color from the deep hue of the egg yolks. Try to find the freshest eggs available to you. With a recipe with as few ingredients as this one, you need to use the fresh and best ingredients you can find. In a saucepan, combine milk and salt. Warm the milk until foamy bubbles form along the edge. Remove from heat. In a large bowl, beat the egg yolks and sugar together until very thick and smooth. Gradually add the hot milk, whisking constantly. Return the mixture back to the saucepan and to the stove. Cook over medium heat, stirring continuously, until the mixture gels slightly and coats the back of the spoon. If small egg lumps begin to surface, remove from the heat immediately. Place a strainer or a piece of cheesecloth over a medium bowl and pour the warm custard mixture through the strainer. Cover and chill in the refrigerator until completely chilled, about 2 hours. In a medium bowl, beat the heavy cream until soft peaks form. Fold the whipped cream into the cooled custard. Pour mixture into a prepared ice cream maker and follow the manufacturer’s instructions to freeze. Transfer to a sealed container and freeze until firm.